A FAVOURITE place. Like, I have a loyalty taco card and every other time I have a free taco waiting for me. 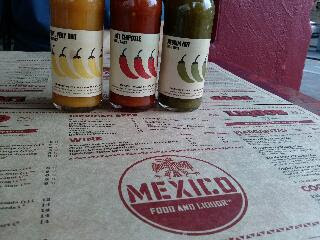 Love soft shelled tacos, and Mexico in Britomart is one of my favourite places in town. Their menu changes every month, so I have to come at least once every month to try them all. Those hot chillis? Hot, hot hot, too hottttt. I've come here many a times, day time, night time, weekday, weekend. I prefer to come here around dusk, when it's still warm, getting slightly chilly. Not too many people, and no queues yet. At nights it can get pretty noisy inside because of the packed in crowd. As the drink of choice, I've ordered cold filter coffee. I've taken a liking for filter coffees lately, and cold filters especially in the recent heatwave of a summer - sadly passing us now. 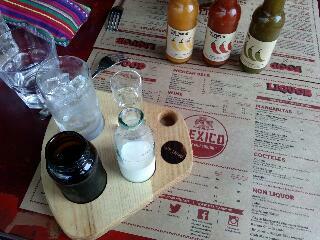 The tray kit comes with a glass, a jar of cold filter coffee, a bit of milk, and a long shot of syrup. A little bitterness is fine for me, though. Tacos, tacos! 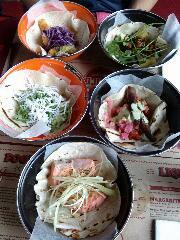 Couldn't choose, so ordered every taco on the menu - though saved the special menu tacos for next time. Normally I prefer any with pork bellies, but this time round, I liked the salmon choice the best. Look how colourful they are. Hmm.. Wondering if I could move to Mexico as my next destination?